In the late 1830’s, one of the ‘original’ real estate bubbles rocked the U.S. economy. Wanton speculation in the course of westward expansion forced land prices in many areas to accelerate beyond reason. This bubble burst in 1837 causing land prices to plummet and the general economy to fall into recession. A side effect of this was the withdraw of the limited amount of hard currency in circulation. 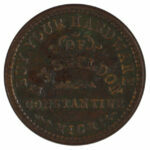 As a response private companies issued these copper tokens as a circulating medium to fill the void and also provide political and social commentary of the day. This token portrays a Liberty Head on the obverse and is dated 1838. The headband is inscribed ‘Loco Foco’. The reverse is inscribed ‘Mint Drop’ within a wreath.